In February 2013, a man stood on a balcony in Italy overlooking a swarm of his devoted worshipers below. Many had dropped everything to be there, travelling from far and wide in the hope of getting a mere glimpse of their icon. As the man looked down on the adoring crowd below, he smiled, waved, and began to passionately fist pump the air. That last action may give away the fact that this was not the Pope addressing a congregation at the Vatican. Instead, over two hundred kilometres south, Diego Maradona was the man that the masses had come to see. Staying at the Royal Continental hotel in Naples, which overlooks the famous Castel dell’Ovo on the picturesque Tyrrhenian Sea, Maradona was visiting the city whose football team he so brilliantly represented for seven seasons at the peak of his powers. 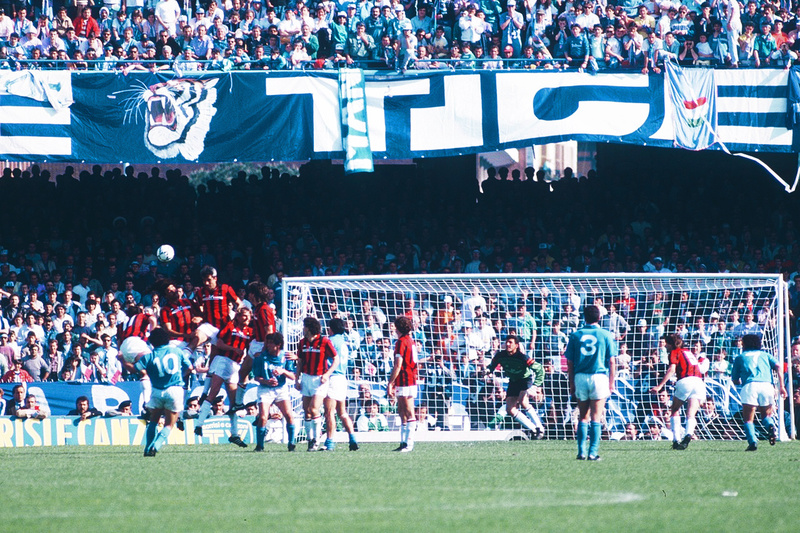 Inspired by the Argentine’s otherworldly abilities, Napoli won their only two scudetti in 1987 and 1990, and the Partenopei’s fans who had gathered in the city’s San Ferdinando district on a mild winter’s day were desperate to show their appreciation once more. This is not just a tale of a ludicrously talented footballer inspiring his side to unlikely victory. It certainly helps, of course, that Maradona was Napoli’s top scorer and best player in their title-winning campaigns, and that the club’s success at the time remains the pinnacle of its 90-year history, but the sheer veneration with which the city of Naples holds Maradona transcends his on-field achievements. The Argentine, in fact, is the perfect symbol of what it means to be Neapolitan. Giuseppe Garibaldi may have unified Italy politically in 1861, but many argue that, 155 years on, the country has yet to be unified culturally. A profound north-south divide, based largely on a substantial economic gulf between the two regions, has plagued Italy throughout that century-and-a-half. Whether the penurious south is detached from the wealthy north because of a non-existent work ethic or decades of political neglect largely depends on which part of the peninsula you come from, yet both sides of the divide would agree that the differences are stark. If the north, represented by the industrial and commercial hubs of Milan, Turin and Genoa, is the engine that drives Italy forward economically, the south, contaminated by corruption, crime and unemployment, was said to be the friction that pulled it back. The inequality is evident in the world of calcio, too. When Maradona arrived in Naples in the summer of 1984, no mainland southern club had ever lifted the league title and, since the Second World War, sides from that northern capitalist triangle of Milan, Turin and Genoa had won the championship on 33 of 39 occasions. Napoli, by far the biggest club in the Mezzogiorno – the Italian nickname for the south – had just a pair of Coppa Italias to their name. For the Partenopei to even pull off the transfer of Maradona was something of a shock: the then-23-year-old may have endured a disappointing couple of seasons with Barcelona, where he was often injured and involved in numerous high-profile disputes with president Josep Lluís Núñez, but his pedigree was immense and his talent blindingly obvious. The eventual fee of almost £7 million was a world record at the time and Napoli’s capacity to pay it reversed the natural order of Italian football and, indeed, Italian society. The backward, impoverished southerners had signed one of the pre-eminent superstars of the global game. 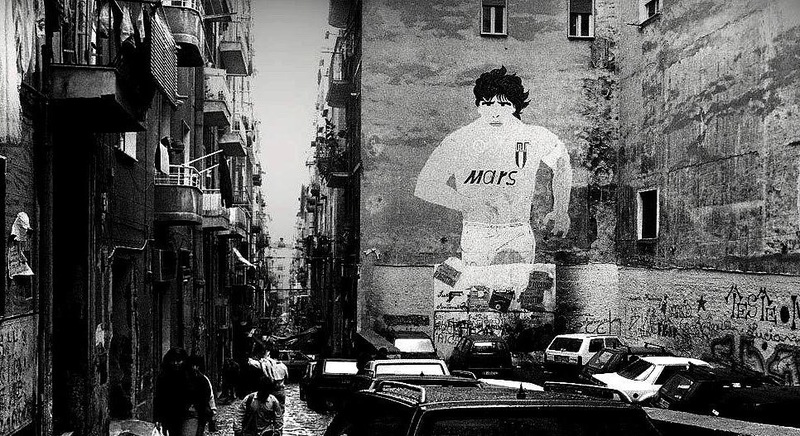 The personalities of Maradona and the city of Naples fitted together almost perfectly. Born in 1960 to a poor family in Buenos Aires – a city with a huge proportion of Italian immigrants and descendants thereof – Maradona grew up in Villa Fiorito, a shantytown in the suburbs of Argentina’s capital. Squeezed into a small house with both parents and four siblings, his upbringing was tough and the odds were stacked against him, but the fact that Maradona made good of himself from such humble beginnings is key to understanding the Neapolitans’ reverence. The Argentine’s recalcitrant, irreverent character also struck a chord with the people of Naples, who are often to known to possess similar qualities. Maradona’s cocaine addiction began a few months before the move to Italy and, by the late 1980s, his dependency and regular party-going had begun to affect his performances. Both Ottavio Bianchi and Alberto Bigon, Napoli’s title-winning managers, frequently fined Maradona for missing training sessions and even matches. In the 1990s, meanwhile, an investigation was launched into an alleged relationship between the striker and the Camorra, the Naples-based crime syndicate, and Maradona was only able to greet his fans from his hotel balcony in 2013 because he was in the country trying to settle a dispute with the Italian tax authorities. 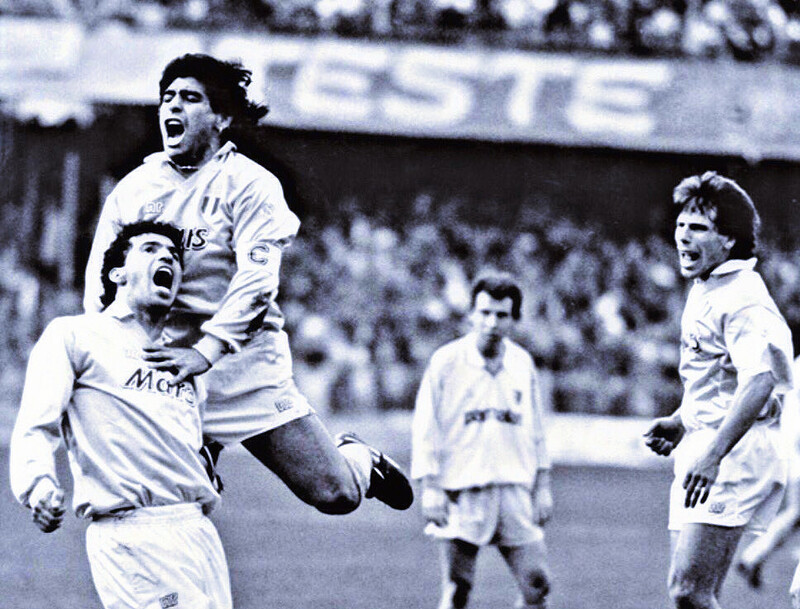 None of this really mattered to the Neapolitans, though, and if anything, Maradona’s imperfections simply added to his cult; it is difficult to imagine the player receiving as much adoration if he was a cleaner, quieter and more obedient character. It is important to stress, however, that while it may be romantic, it is also lazy and false to depict Napoli as a one-man team and attribute their accomplishments solely to the presence of Diego Maradona. The 1987 scudetto-winning side was built on a solid defence made up of Giuseppe Bruscolotti, Moreno Ferrario, Alessandro Renica and a youthful Ciro Ferrara, with Fernando De Napoli and Salvatore Bagni providing a solid midfield base in front. Napoli conceded just 21 times that season, and although Maradona top-scored with 10 goals, Bruno Giordano (five) and Andrea Carnevale (eight) also provided vital contributions. Similarly n 1990, Maradona was aided by the attacking talents of Gianfranco Zola and the Brazilian Careca, with Ferrara, Renica, De Napoli and Carnevale all still key players. Nevertheless, Maradona was undoubtedly the star of the team, and it is he who became the symbol of Neapolitan triumph. Murals of his face adorn buildings around the city, 20,000 people wrote ‘Viva Maradona’ on their local election ballot papers in the late 1980s, a hair from his head is kept safely guarded in a local shrine, Napoli’s number 10 shirt was immediately retired and some Partenopei ultras even supported Argentina in their 1990 World Cup semi-final with Italy, an act that has never been forgiven by the fans of northern clubs such as Milan, Inter and Juventus. Maradona captured the imagination of the city of Naples, not just through his mesmerising footwork and breathtaking ability, but through his personality, eccentricity and sympathy for their cause. Napoli’s achievements in this five-year period – not only the two league championships, but a Coppa Italia (1987), UEFA Cup (1989) and Italian Supercup (1990) – put Naples and the whole of the Italian south back on the map for reasons other than corruption, lawlessness and inertia, and the southerners’ almost congenital defeatism and inferiority complex was, albeit temporarily, joyously alleviated. Youngsters from the Mezzogiorno began to support Napoli instead of Juventus, no longer having to look north to attach themselves with success. The Partenopei represented a vehicle of resistance to their snooty northern neighbours, and the region was filled with hope that dreams could be realised without moving northwards or emigrating to the Americas, as a large proportion of southern Italians had done since unification. This period was a time of social revenge, payback for the inequity and antagonism, the negligence and divestment, the years of being insulted as peasants and terroni. Naples had proved itself to be more than a match for anything Milan, Turin and Genoa could offer, and northern Italy’s hegemony had been broken in the most satisfying of ways. Maradona’s tax feud continues to rumble on, the Italian authorities insisting that the 56-year-old still owes £33 million to the state, a figure that Maradona strongly repudiates. The Argentine’s wish to bring his grandson to watch Napoli play at the San Paolo therefore looks like it will go unfulfilled for a little while yet. Maradona has pledged to clear his name, even appealing to the European Union to arbitrate the dispute, but his lawyers are aware that the Agenzia della Entrate can only seize assets when their client is in Italy, making an appearance any time soon extremely improbable. Having had Rolex watches and a pair of diamond earrings confiscated on previous visits, it is likely that the Neapolitans will have to wait a little longer for another encounter with their hero.